The strong and stalwart Kangaroo Desktop Riser has been upgraded for the new electric riser category. A heavy-duty motor with 150 lbs. lift capacity guarantees a standing workstation, no matter the workload. As always, stability is key, and the 'Roo is more stable than any other riser we've tested, thanks to the extra support from the stabilization leg. With the same DNA as other Kangaroo products, the Electric Kangaroo has a wide range of adjustability, and an independently-adjustable monitor mount. Monitor tilt, pan, and rotation are all easily adjustable, and the included stabilization leg prevents distracting worksurface shaking. 150lbs lift capacity is far and away the strongest among risers. The Kangaroo is a bit less pretty that some other, less-performing desktop risers, with its 'form follows function' design philosophy. In the past few years desktop risers have stormed the market, providing sit/stand productivity benefits to users who for whatever reason have been unable to part with their fixed-height sitting desks. For most of their existence these risers have been manually-operated, relying on tensioning springs and counterbalance systems for worksurface and monitor adjustability. But recently, a new wave of risers has entered the marketplace, this time adjusted with electric motors. It seems that desktop risers have entered into an arms race of sorts, vying for technological superiority and market dominance in a rapidly-growing category. 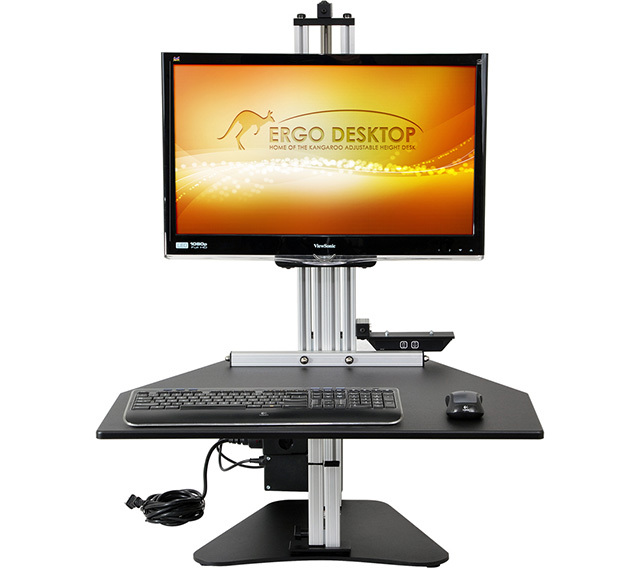 Now, ErgoDesktop has hopped into the fray with their Kangaroo line of desktop risers. This eminently-stable riser, which took the Expert’s Choice spot in the last round of reviews, has been outfitted with a heavy-duty electric motor to make height adjustment possible at the push of a button. Installation is simple enough, with the major component – the mounting column – already assembled. After securing it to the baseplate and sitting it upright, all that’s left is to attach the monitor mounting gear and the worksurface to the Kangaroo. The installation manual is clear and well-designed, with every part labeled and illustrated, and all steps neatly laid out. It’s much like installing a regular Kangaroo, though with the added step of attaching the motor and controller, and plugging them in. With everything said and done, you’re looking at about half an hour of installation. After assembling the Electric Kangaroo Pro, it became apparent that the apple did not fall far from the proverbial tree. The same ‘form follows function’ aesthetic that described the original Kangaroo has made its way into the electric riser category. A thin, laminated worksurface with steel columns, the Kangaroo is not afraid to show off all of its nuts and bolts, and it looks aesthetically exposed and inelegant. Our biggest criticism is that the two-button controller is located inconveniently on the mounting column so you have to reach past your worksurface to change the Kangaroo’s height, unlike with the One-Touch risers, whose controllers are embedded into the top shelf. The Kangaroo might not be the most gorgeous thing you’ll put on your desk, but it does get the job done. It’s equipped with the same 24”x28” worksurface as the older Kangaroo models with plenty of space for keyboards, mice, and more. Unlike the One-Touch line of risers, there is currently no option for a drop-down keyboard tray, but if you’re willing to live with that you’ll find the Kangaroo a roomy experience. Like its manually-operated cousin, the Electric Kangaroo Pro provides a wide range of adjustability options. For starters, the electric model boasts 20.5” of electric height adjustment, a good 4” more than the manual. The monitor can then be manually-adjusted independently up to 6”. The pan, tilt, and rotation of the monitors are all adjustable as well, and users can look forward to a desktop riser that they can customize to their specific needs. The original Kangaroo had the strongest lifting capacity of any manually-operated desktop riser, and it looks like this new model will continue that tradition. The powerful Linak motor on the Kangaroo can lift up to 150 lbs, exceeding its strongest competitor, Ergo-Tech's One-Touch, by a hefty 50 lbs. Whatever your workload is, the Kangaroo can almost certainly take it to standing height. One downside to this more powerful motor is also somewhat louder than the One-Touch, with more of a high-pitched whine than a low purr. Despite this, it still manages to clock in at a lower volume than many electric desks on the market, like the GeekDesk. Kangaroos have traditionally been the most stable of all desktop risers, thanks to the use of its adjustable stabilization leg. Not a pretty solution, to be sure, but it ensures rock-solid worksurface rigidity at a level that no other riser we’ve tested has been able to replicate since. That stabilization leg reprises its role in this new Kangaroo, and during our testing the electric Kangaroo’s proven the most shake-resistant of any motorized riser. Just remember to remove the stabilization leg before lowering the worksurface to prevent damage to the riser. The Electric Kangaroo Pro is available in both single- and dual-monitor configurations for PC, and a single-monitor configuration for iMacs. The mounting hardware can be used with any VESA-compatible monitor up to 25” wide and has a combined monitor capacity of 40 lbs. It doesn’t have the same monitor capacities as the One-Touch Ultra, which can support up to four monitors, but most users will find it sufficient for their needs. 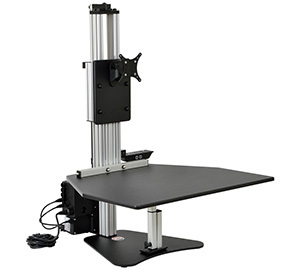 The manual Kangaroo offers the option of a top shelf to set monitors with stands, for users without VESA-mounted monitors. Prices for the Electric Kangaroo are comparable to what's on the market for other motorized risers. A single-screen 'Roo starts at a cool $699 ($749 for the Mac version, which includes an VESA adapter kit for iMacs). The dual-monitor Elite model comes in at $799. In addition, users can kit out their riser with some standard Kangaroo accessories, like detachable side work surfaces or a keyboard extension. See the "Price Options" tab for the full price guide. Like other Kangaroo models, the Electric ‘Roo is available in four worksurface finishes: black, putty, cherry, and light maple. The Kangaroo ships for free anywhere within the lower 48 states, at about a 3-4 week ship time. The Kangaroo continues to impress us with its adjustability and heavy lift capacity. While it's still early to tell which electric riser will reign supreme in this new category, we certainly have a strong contender on our hands. Power, adjustability, value – this Kangaroo has it.